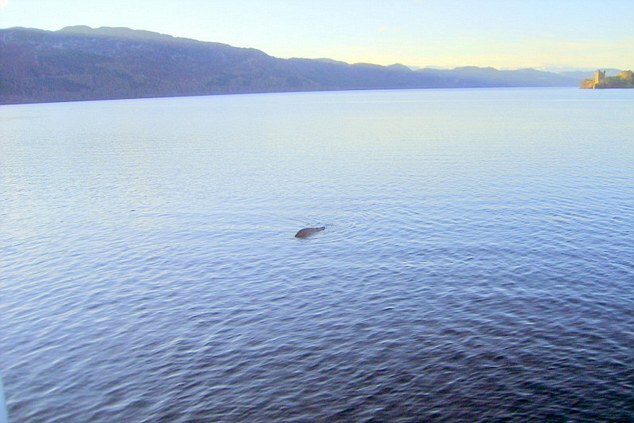 Photo taken by George Edwards in 2012 of an object in Loch Ness near Urquhart Castle. 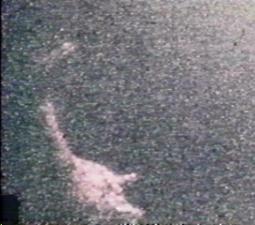 One of Robert Rines's photos purportedly showing the Loch Ness monster. Peter Scott's painting of Nessiteras rhombopteryx. Tales of strange creatures in Scottish lakes date back at least to the country's conversion to Christianity, while Nessie's own recorded history began in 565 AD. when he or she was said to have been glimpsed by Saint Columba and his holy band (though in the River Ness rather than the lake itself). The modern fascination with a monster in the loch started in the 1930s when a road was built giving easy access to the lake. On April 21, 1934, the Daily Mail published a photo showing what looked like a long neck and head rising from the water. But what became known as the "Surgeon's Photo" turned to be an elaborate hoax perpetrated by big-game hunter Marmaduke Wetherell, surgeon Robert Wilson, and Wetherell's stepson, Christian Spurling. Shortly before his death in 1994, Spurling revealed that object in the photo was nothing more than a toy submarine fitted with a sea-serpent head. Other famous sightings followed. In 1938 a South African tourist filmed something moving in the loch for three minutes on 16 millimeter color film. In 1960, aeronautical engineer Tim Dinsdale filmed a hump crossing the water leaving a powerful wake. And in February 2012, a sonar image of a large object moving deep below the surface of Loch Ness earned boat skipper Marcus Atkinson the Best Nessie Sighting of The Year Award from bookmakers William Hill. Attempts to take pictures in Loch Ness have always been hampered by the permanently poor visibility. The water is very peaty and the best cameras and the brightest lights are able to penetrate no more than about 8 to 10 meters into the gloom. However, undeterred by this, a successful Boston inventor and patent lawyer, Robert Rines, recruited a team of experts in the early 1970s to help him set up some of the most sophisticated equipment then available. With it, he was able to take underwater photos and sonar measurements from any chosen point in the lake at the rate of about one a minute. In 1975, after fifty weeks of photography spread over a six-year period, he announced his most positive results – and sparked off a sensation. Two of Rine's photos seemed to show a flipper-like appendage, about five feet long, which sonar measurements suggested were attached to a much larger, moving object. 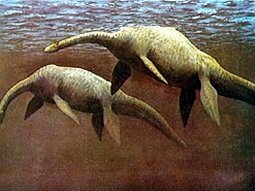 A third photo was presented as possibly being of Nessie's body and long neck, while a fourth had the appearance of a curious head, resembling a gargoyle, with a hooded eye, a snout, and a pair of horns. Based on the shape of the "flipper", the naturalist Peter Scott (grandson of the famous Antarctic explorer) proposed a scientific name for the creature: Nessiteras rhombopteryx. Scott also produced a painting which left no one in any doubt what he considered to be the most likely identity of the loch's mysterious occupant. The similarity to a plesiosaur, a huge prehistoric marine reptile, was unmistakable. For several days, Rine's announcement was front-page news in the British and international press. The television networks hastily put together special programs on the subject. Speculation ran riot. Statements were read out in the House of Commons. From four indistinct photos taken in murky water in unknown directions of objects of uncertain size and distance, the possibility rapidly took hold in the public mind that Loch Ness was home to a breeding colony of plesiosaurs. It was like the saga of the martian canals being played out all over again. Except that instead of the canals of Mars there was the gargoyle head, and in place of Percival Lowell there was Peter Scott to give the sensational claims a dash of scientific respectability. One wag mischievously noted that Nessiteras rhombopteryx was an anagram of "monster hoax by Sir Peter S." – but Scott was perfectly serious. Twelve years elapsed. Once again Loch Ness came under the spotlight of the world's media, attention this time being focused on a flotilla of twenty identical motor launched laden with the most sophisticated sonar gear from the US. Operation Deepscan, a comprehensive ten-day sounding of the entire lake, was about to begin. The project had a wider brief than merely the detection of the loch's most elusive inhabitant. It was intended to study all of the fauna living below 600 feet, to plot some of the loch's deepest waters (down to 1,000 feet), to monitor the distribution of fish and to measure temperature variations in the lake. But the media had ears only for the monster hunt. As Adrian Shines, leader of Operation Deepscan, commented: "I think I upset them [the press]. No matter what I said, it fell far short of what they wanted." In the event, Deepscan neither proved nor disproved the existence of Nessie. But it did reveal the true identity of the strange gargoyle head that Rines had photographed. It turned out to be nothing more exciting than a rotting tree stump, sitting on the lake bed and still recognizable after a dozen years. Disgruntled reporters decamped in droves. Apparently, there were to be no sensational center-spreads of Jurassic reptiles, no close-ups of nightmarish leviathans that time had forgotten, no money-making scoops. And yet, almost unnoticed because the media band-wagon had moved on, Deepscan did come up with something new and interesting. Among its many sonar contacts were few that were stronger than would have been expected from ordinary Scottish lake fish, such as salmon or trout. They were, said Shines, "equivalent in strength to a shark but not equivalent to a whale." Since Loch Ness is neither brackish nor linked in any way to the open sea, Shines was forced to conclude that some abnormally large freshwater fish might patrol the lake's depths. But, again, this is conjecture: the data are too imprecise, too open to interpretation, too close to the noise level, for anyone to be really sure. There are a couple of very good reasons to doubt there could be anything very large living in Loch Ness. First, of course, there would have to be a viable breeding population of creatures – say, at least, a few dozen individuals – and it's hard to imagine how so many big beasts could remain so well hidden most of the time. Second, the loch is nutrient poor. There isn't on the face of it the kind of food supply, animal or plant, available to keep a colony of big animals alive. Yet the romance continues. It seems that only by draining the loch could the truth about the monster be revealed beyond dispute – and that would hardly be good for the thriving local tourist industry or the health of the mythical creature on which it's based.